Luis Carlos Aguirre Pi√±a, of Chihuahua, Mexico, stands near a work station where he cleans buckets that will be used to store organic wheat. He works at an organic wheat farm and cattle ranch in Fairview. He is in the U.S. on an H-2A temporary agricultural work visa. Luis Carlos Aguirre Pi√±a, of Chihuahua, Mexico, works at an organic wheat farm and cattle ranch in Fairview. He is in the U.S. on an H-2A temporary agricultural work visa. Luis Carlos Aguirre Pi√±a, of Chihuahua, Mexico, cleans buckets that will be used to store organic wheat. He is in the U.S. on an H-2A temporary agricultural work visa. Luis Carlos Aguirre Pi√±a, of Chihuahua, Mexico, cleans buckets that will be used to store organic wheat. He works at an organic wheat farm and cattle ranch in Fairview. He is in the U.S. on an H-2A temporary agricultural work visa. Life in Camargo isn’t easy right now. Luis Carlos Aguirre Piña hears gunshots at night, and drug dealers murder anyone they want. The police are corrupt. And it’s hard to find a job not associated with the Mexican mafia. About 11 million illegal immigrants live in the United States. Aguirre is not one of them. Instead, Aguirre leaves his Camargo home in the Mexican state of Chihuahua and travels 900 miles northeast to work legally in the U.S. through the H-2A Temporary Agricultural Labor Certification Program. He currently lives and works on John’s Farm and Cattle Tracks, an organic wheat farm and cattle ranch in Fairview, a town of about 2,700 people in northwestern Oklahoma. The H-2A program exists in case there’s a shortage of agricultural workers. And Aguirre’s employer, Kris Gosney, says that’s the case in Fairview. No one seems interested in farm labor, even high school students looking for extra cash. “When our children were younger, and in junior high and high school, it seemed then it was a little easier to find a couple of young people to work on the farm, but when our youngest one was getting into high school, we started to notice the trend to work in town and not on the farm, be an urban kid and not a farm kid,” Gosney said. About 10 years, the Gosneys started using the H-2A program. Aguirre is one of two H-2A workers there now, and he helps take care of the cattle and harvest wheat. He also drives the tractors, cleans equipment and unloads wheat. Last year, about 56,000 H-2A visas were issued to foreign laborers. About 52,000 of them were granted to Mexican foreign laborers. South Africans, where the Gosneys’ second H-2A worker is from, were the second largest group with about 1,100 H-2A foreign laborers. Peruvians made up the third largest group at 830 workers. Ten years ago, the same three countries were the top three for H-2A visas granted. Public information officers at the U.S. Department of Labor, U.S. Customs and Border Protection, U.S. Citizenship and Immigration Services and U.S. Immigration and Customs Enforcement said their agencies didn’t record the number of workers who came to the U.S. on an H-2A visa and did not return to their home country. Aguirre started coming to the U.S. on a temporary work visa in 2003 through the H-2B Temporary Non-Agricultural Labor Certification Program. He worked as a supervisor for a landscaping company and at times made $1,000 per week, 10 times what he would have earned in Mexico. When the U.S. recession hit, the landscaping company was purchased by new owners, who hired enough American workers to no longer utilize the H-2B program. Aguirre then began applying for the H-2A program. 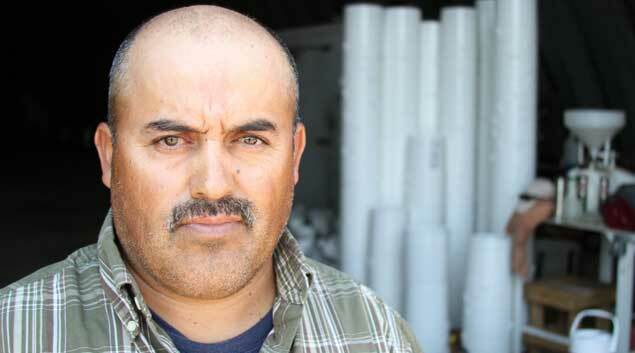 Aguirre, who traveled to the U.S. on six H-2B visas, is now on his third H-2A visa. Under the H-2 programs, Aguirre is classified as a “nonimmigrant,” someone who temporarily comes to the U.S. to work and then goes back to his or her home country. Aguirre hopes some day to change that classification to “immigrant.” He wants to apply for an immigrant visa and become a legal resident of the United States. Most immigrants come to live permanently in the U.S. through a family member’s sponsorship, employment or a job offer, according to U.S. Citizenship and Immigration Services. Aguirre’s brother, who lives in Texas, is a U.S. citizen and could sponsor Aguirre for a Family Fourth Preference immigrant visa. Aguirre’s brother received his citizenship because he qualified for amnesty under the Immigration Reform and Control Act of 1986, which granted amnesty to some agricultural workers and also illegal immigrants who had lived in the U.S. continuously since Jan. 1, 1982. The process that Aguirre would go through to obtain a visa through his brother’s sponsorship is slow and expensive. The waiting list for sibling-sponsored visas is the longest line out of the family-sponsored visas. There’s a cap of 65,000 sibling-sponsored visas granted each year, and demand far exceeds the number of available visas. About 740,000 Mexicans are on the waiting list for a sibling-sponsored visa. That makes up 30 percent of the 2.5 million people on the waiting list. Currently, anyone from Mexico whose siblings applied to sponsor them 15 years ago qualifies. If Aguirre’s brother applied today, and if the process took only 15 years, Aguirre would be 59 years old before he could legally come to the U.S. And that’s if everything went smoothly. So, for now, Aguirre will use the H-2 programs as a means to support his family. Before he began working in the U.S. Aguirre held odd jobs around Camargo, delivering potato chips to grocery stores, selling frozen fish, working on farms and doing construction work. Back home in Camargo, Aguirre has a wife and several family members he helps support thanks to his H-2 jobs. He helps his sister, a single mother, pay for her children’s school uniforms and school supplies. He also has a mother-in-law who is diabetic and went blind because of the disease. “The medicine is expensive, so I try to come here and help as much as I can,” he said. A few weeks ago, Aguirre experienced heat-related illnesses and was sent by ambulance to an Oklahoma City hospital. He spent about a week in the hospital. That trip along with other doctors’ visits cost him about $11,000. Aguirre is uninsured. Doctors told him until he lowers his cholesterol and blood pressure, he should not work outside. He cannot transfer to another H-2A job, so Aguirre will likely go home to Camargo, where he might work at a grocery store for about $55 a week. Aguirre is worried about what will happen if he cannot pay the bill. He’s worried about any future opportunities he will have within the H-2A program. He’s worried that this will be his last time to work in the U.S.
“I don’t think they’ll give me a visa anymore,” he said. “I wish…,” he adds, trailing off.